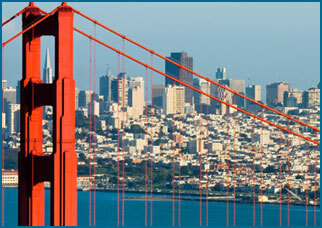 San Francisco, the City by the Bay, is a city for fun, family, business and pleasure. Whether for a family wedding, a business trip, or a night out on the town, we're there to take you in style. Our San Francisco Party Bus and Limousine services match the perfect chauffeured luxury car service to your specific needs and wants. Million Services Party Bus and Limousineis a highly-rated and long-standing luxury chauffeur service in San Francisco, the Bay Area, Napa Valley and Sonoma Valley as well as other areas from Oakland to Berkeley and throughout the Wine Country. We have a 5-Star rating on Yelp and a record of providing only the best service and quality. Our drivers are highly experienced and personally familiar with not only San Francisco and Bay Area roads but also have a great knowledge of San Francisco's famous landmarks, restaurants, hotels, bars and clubs, museums and other attractions. Our in-depth knowledge of areas from Fisherman's Wharf to SoMa, Golden Gate and other major neighborhoods allows us to show our clients the best and safest time. Our Napa Valley Party Bus and Limousine Wine Tours are an insider's tour of the best wineries and vineyards in the Wine Country. From airport pickup to your Wine Tour drive from San Francisco to Napa, Sonoma o other destinations in the Wine Country, we have not only the luxury and comfort of our late-model limos, sedans, stretched limousines and party buses but also our ADA vehicles for our guests with disabilities. San Francisco Party Bus Rentals with specific Wine Tours from San Francsico and local Bay Area locations to Napa Valley, Sonoma and the rest of the Wine Country. Do you need airport service to airports in and around San Francsico and the Bay Area? Our airport service provides for on-time pick-ups from our courteous and knowledgeable drivers. We know the best routes based on the time of day, destination and route. Honestly, you don't even need a full review just take my word for it & book with Million Services! Reese was awesome in helping me choose a vehicle that would be the best fit for my group and my budget which I appreciated. Dalisa, our driver, was so sweet! She arrived early and was very professional! I will only use this limo service from now on!